Nancy Sue Ludrick (nee Harrell), 87, of The Woodlands, TX passed away on January, 16, 2019. A Memorial Service and reception will be held at Founders Baptist Church in Spring TX at 3pm on Saturday, January 19th, 2019. 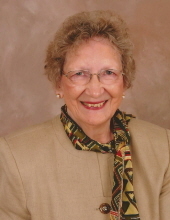 Nancy was a devoted and compassionate Registered Nurse and served in several capacities throughout Montgomery County including Visiting Nurse Association and Laurelwood Hospital. Nancy loved her family. The highlight of any day for Nancy was a visit from her family. Nancy loved her church, Founders Baptist Church, and she let everyone know how much she loved her church. The Lord Jesus Christ were at the top of her life's delights. Nancy was a voracious reader and the Bible was her favorite book. Her motto was, "God's Word, First Word" as she was diligent to read God's Word first thing in the morning. Nancy also loved both reading and discussing Reformed theology. Her favorite book was the Bible and her motto was "God's Word, First Word". Nancy's library will be donated to her church, Founders Baptist Church. Nancy was born June 3, 1931 in Houston TX. She graduated from Magnolia High School in Magnolia TX in 1949 and from the Lillie Jolly School of Nursing in 1958 in Houston, TX. She was preceded in death by husband Harold Raymond Ludrick of Coffeeville KS; son Michael Raymond Ludrick; brother William Warren Harrell Jr (Buddy) and wife Nell of Newark CA; parents William Warren Harrell Sr and Ruth Elaine Harrell (nee McWilliams). Survived by children Kathryn Ludrick of The Woodlands TX, Karen Bice of Yreka CA, Roger Ludrick of The Woodlands TX, Craig Ludrick and wife Nancy of The Woodlands TX, Rodney Ludrick and wife Kelly of The Woodlands TX; grandchildren Renae Ludrick, Kiki Bice , Kyle Bice, Caleb Ludrick and wife Shannon, Ashley Ludrick, and Emily Ludrick; great grandchildren Madison, Teagan and Alden Bice and Braxton Rushing; brother Charles and wife Sara; nephews William Courtney, Wren Harrell, Randy Harrell, and Kenny Harrell. To send flowers or a remembrance gift to the family of Nancy Sue Ludrick, please visit our Tribute Store. "Email Address" would like to share the life celebration of Nancy Sue Ludrick. Click on the "link" to go to share a favorite memory or leave a condolence message for the family.